Error Franken-bach Leopard, the commander officer of La Metal. Initially, he was loyal to the Millennial Queen. 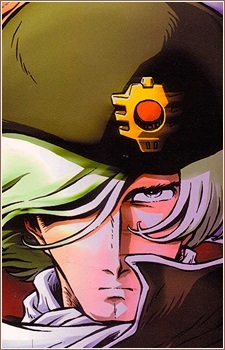 As he realizes that he still has humanity left in him, he joins Maetel, Nazca, Emeraldas and Harlock and betrays the Promethium II, the Millennial Queen and her plan to convert all mankind into a cyborg. He was shot and killed by a half dead cyborg when he was being praised by people he saved. He was able to kill the cyborg before he fell to the grounds. Undefeated commander of the La Metal. Millennial Queen orders Leopard to investigate her own daughter Yukino Yayoi, who was suppose to be enthroned and become the Queen of La Metal, the next Millennial Queen. He is later killed by Yayoi when he attempted to kill Seren, Yayoi's younger sister. However, Seren was prepared to die by Leopard's hands, as if she owes him her life. She remembers him as her instructor who cared for her before she was abandon by her mother, Millennial Queen.